ONI Bureau: Former Odisha Minister and veteran Congress leader Padmalochan Panda has joined the Bharatiya Janata Party (BJP) today in the presence of Union Minister Dharmendra Pradhan and party’s state unit President Basant Panda. 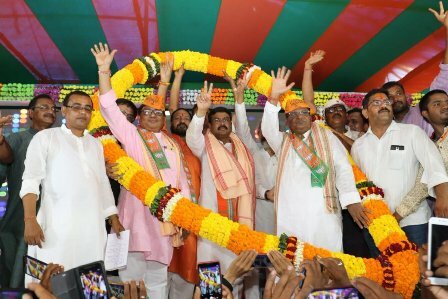 The three-time Congress MLA from Simulia joined the saffron party along with thousands of leaders and supporters at the ‘Mishran Parva’ held at Patrajpur in Khaira block in Balasore district. Another senior Congress leader Subhankar Mohapatra also joined the BJP. Senior BJP leaders Manmohan Samal and Pratap Sarangi were present at the occasion. Padmalochan Panda, who was the Minister of State for Fisheries and Animal Resources Development and Panchayatiraj departments from February 22, 1999 to March 5, 2000, had resigned from the Congress on October 7. “I have joined the BJP after being inspired by the development agenda and charismatic personality of PM Narendra Modi,” said Padmalochan Panda. Union Minister Dharmendra Pradhan welcomed him and others and expressed confidence that their presence would boost the party’s prospects in coastal Odisha. BJP’s State General Secretary Bhrugu Baxipatra too welcomed the new leaders and said, “Those who want to build a #NewOdisha , see hopes in BJP. That’s the power and strength of the party under the visionary leadership of PM Modi”.